Exploring the destroyed parts of Mosul, RT has been able to gather more evidence in support of Amnesty International's report which accuses the US-led coalition and Iraqi government of indiscriminately bombing houses with civilians inside along with ISIS targets. 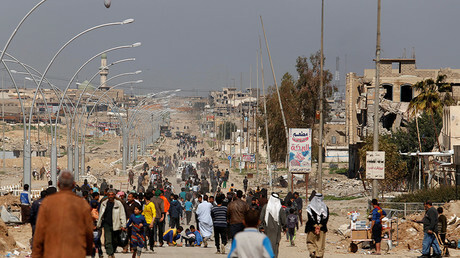 The debris of destroyed houses, schools and hospitals have turned Iraq’s second largest city into an urban graveyard after the US-led coalition and Iraqi government forces launched the offensive in October to liberate the city. With explosions and gunfire heard in the distance, RT's crew saw US-led coalition jets heading to and from Mosul every 5–10 minutes on Tuesday night. They also witnessed an Iraqi helicopter launching missiles at IS targets on Wednesday and heard chilling stories of how Islamic State (IS, formerly ISIS/ISIL) terrorists continue to use civilians as human shields during airstrikes. But instead of organizing humanitarian corridors for civilian to leave the city, the Iraqi government, as noted in the Amnesty International report earlier this week, has been urging Mosul residents to stay inside. Unfortunately for many of them, the perceived safety of their homes became their graves, as Iraqi and US forces continue to target their houses. “Hundreds of civilians have been killed by airstrikes inside their homes or in places where they sought refuge after following Iraqi government advice not to leave during the offensive to recapture the city of Mosul from the armed group calling itself Islamic State (IS),” Amnesty said Tuesday in their detailed report based on witness' testimonies. The city itself and the refugee camp near Mosul are full of people whose houses were hit or destroyed just after they ran away ignoring government advice. “When we were in our home, it was hit by a shell. We went to my parent’s house, and it was hit by a rocket. Wherever we went, we’d be bombed. 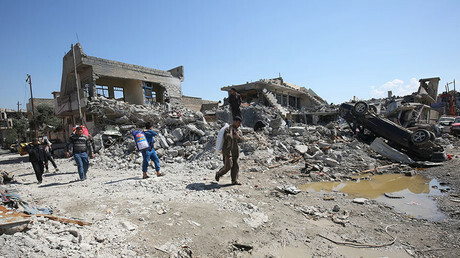 I heard an airstrike destroyed our home,” one woman with a child told RT. “This is the bombing, they are destroying everything,” local resident named Akram told Ruptly. Others on the ground in Mosul have complained to RT that IS continue to use civilians as human shields during daily airstrikes, terrorizing residents and preventing anyone from leaving the western Mosul. “IS hurt us a lot, they starved us; there is no water to drink, there is no gas, there is no food,” said Abdlrazaq Abdalkarem Qasim a Mosul resident. “There are 4 or 5 families that can't come out, the fighting is weakened. These guys [the Iraqi army] keep fighting, they can´t beat them but they [Daesh] are using a lot of snipers,” said Basim Muhammad Jasim, another local of Mosul. Rovera told RT that the US coalition is failing to undertake “all possible and feasible precautions to minimize civilian casualties,” especially when it comes to cases where civilian structures are destroyed. “The use of munitions and tactics at times are causing civilian casualties — notably in situations where ISIS fighters are on the roof of houses — large munitions have been used which have destroyed those houses and killed the civilians in the house,” Rovera explained on Tuesday. Following Amnesty’s report, the Pentagon admitted that its air campaign in Mosul “probably had a role” in the mounting civilian death toll in the city. “If these innocents were killed by the coalition, it was an unintentional accident of war,” Lieutenant General Steve Townsend the commander of the Combined Joint Task Force-Operation Inherent Resolve said Tuesday, as the UN Human Rights chief announced that at least 307 people have been killed and 273 wounded in just over a month in Mosul. The US insists that no more than 200 civilians have been killed in coalition airstrikes in Mosul, but the UK-based monitoring group Airwars says the number could be more than 10 times higher. Some 400,000 civilians are still trapped in the Old City of Mosul, which is held by IS militants. 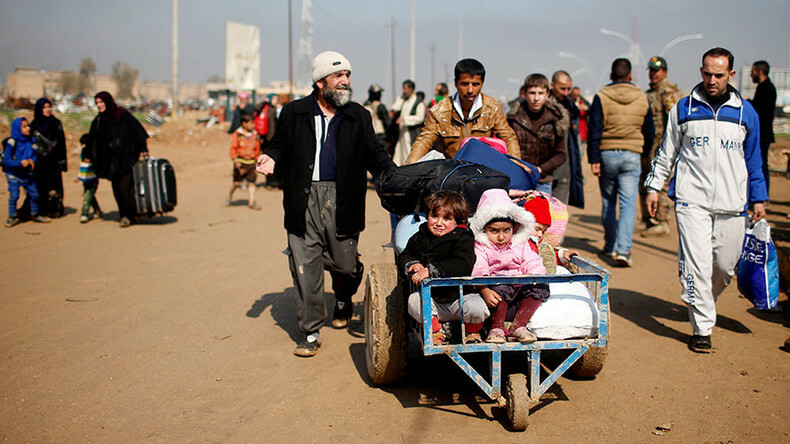 They are facing food and electricity shortages, a representative of the UN High Commissioner for Refugees (UNHCR) in Iraq earlier told Reuters, adding that between 8,000 and 12,000 people flee the city daily.